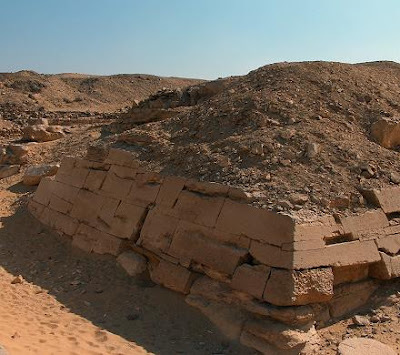 Sekhemkhet, one of the kings succeeding Zoser, chose his site close to the original Step Pyramid complex. At the south-west corner of Zoser’s complex, Sekhemkhet laid out his enclosure about equal in length and about two-thirds in width. Planned on a base measuring about 395 feet square, the pyramid would have reached an estimated height of about 230 feet in seven steps, but because his reign lasted only six years, an unusually short period of time, much of the work was never completed. In later times the structure was used as a quarry, and it is now impossible to ascertain the height to which it was originally built. Sekhemkhet’s Pyramid paralleled the interior of Zoser’s, with a maze of corridors, rooms, blind doors and blind galleries. During the excavation of this pyramid in the early 1950’s, the main corridor of the vertical shaft was discovered to have been still intact. Sealed in three places, the shaft led to the chamber corridor whose doorway to the burial chamber was still sealed with thick blocking walls of stone. No signs of tomb robbers was evident, and when the expedition led by Zakaria Goneim on behalf of the Service des Antiquites of the Egyptian Government, entered the burial chamber, they found a closed and sealed sarcophagus, on which a wreath had been placed. This sarcophagus, carved from a single block of alabaster, was very exceptional. Instead of having an entire top as a lid, one end of it was a sliding panel manipulated by a rope and pulley system. Plaster which had sealed the panel in its grooves after its ceremonial closure signified that it had not been disturbed since the time of the funeral. When the sarcophagus was finally opened it was found to be empty! The deceptive indications of the shaft, burial chamber, and corridor and the missing mummy are a mystery which the archaeologists were hard put to explain. Naturally, more than one theory has been offered. One is that the body and its costly belongings were stolen by conniving priests and dignitaries in charge of the burial. The other is that the entire burial chamber was a dummy to protect the real location of the mummy which was buried in a still undisclosed tomb within the Pyramid or in another structure.